Denting the NDA ahead of the 2014 Lok Sabha elections, the JD(U) today parted ways with the BJP in Bihar to protest against the elevation of Narendra Modi, bringing to an end a 17-year-old alliance that had held firm in national politics. The Congress today effected major organisational changes as it prepared to reshuffle the Union Council of Ministers on Monday, hoping these changes will inject new enthusiasm into the party and provide greater momentum to governance in the run-up to the 2014 Lok Sabha polls. 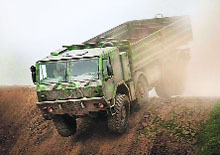 Considered as the �backbone� of the Indian Army�s rapid response to any attack along the western front for long, the Czech-built Tatra trucks may not be purchased from now on. The reason: India-built trucks have now improved a lot and could be selected for forthcoming expansion drive or replacements for Tatra trucks, resulting in saving foreign exchange and unhinging India�s reliance on foreign suppliers. ON WAY OUT: An 8X8 heavy duty universal cargo/troop carrier from the house of Tatra. After China, it�s India�s turn to woo oil-rich Iraq to meet its growing energy needs. With Indian imports of crude from Iran dipping by the day, External Affairs Minister Salman Khurshid is heading to Iraq this week to discuss the possibility of increasing oil imports from the Arab nation. Monsoon today roared into Delhi and hit Punjab and Haryana almost a fortnight in advance as heavy rains lashed northern India, driving away the heat and spreading cheer among the people. Strong easterlies pushed the monsoon clouds over the national capital with seasonal rains now having covered the entire country almost a month in advance, MeT officials said. "Monsoon reached Delhi today and also covered the entire country," said IMD director Brahm Prakash Yadav. The normal date for the arrival of monsoon in Delhi is June 29.